OptiLink offers reliable internet services in Dalton,GA. If you’re thinking of switching your internet provider visit us online or give us a call at (706) 529-1313. 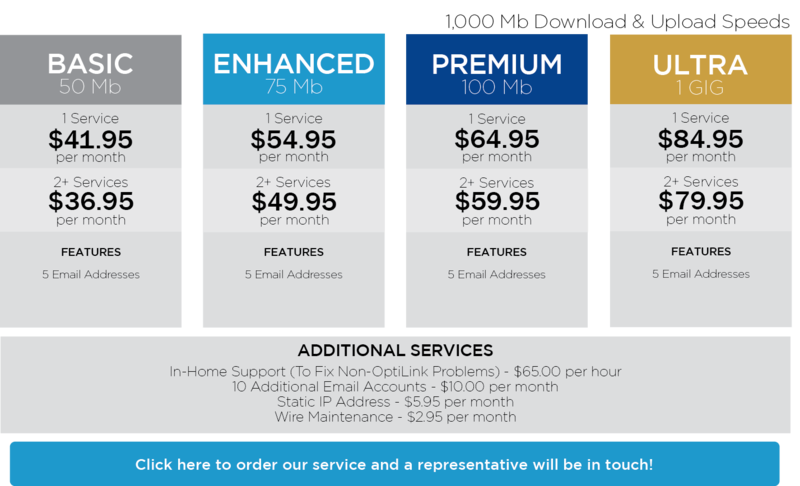 You can select one, two, or all three of OptiLink’s services — Internet, TV & Phone. Discounted rates are available when you bundle. With OptiLink, you will have no contracts, no short-term promotional offers, no hidden fees, and no fine print! Sign up for a service today by selecting a package below or you can give us a call at (706) 529-1313. For pricing and information, click on an icon above. If you require special services due to a disability, email us at assistance@optilink.us.